The Drexel University women’s lacrosse team broke their three-game win streak with a loss to Robert Morris, bringing them to a 5-5 record (Photograph courtesy of Greg Carroccio). The Drexel University women’s lacrosse team dropped a match last weekend, falling to the Robert Morris University Colonials 13-10 March 30 at Vidas Field in Philadelphia. The loss breaks a three-game win streak for the Dragons and brings their record to an even 5-5 on the season. Drexel got off to a great start in the matchup. Sophomore Karson Harris won the opening draw, and the ball found sophomore Colleen Grady, who netted a goal just 13 seconds into the matchup. However, just 17 seconds later, sophomore Rachel Ward scored an equalizer goal for the Colonials. Robert Morris then netted three more goals to take a strong early lead. Junior Clio Kerr scored her ninth goal of the season, followed by one from junior Mackenzie Gandy and wrapped up with a goal from junior Meghan Crouse. Junior Courtney Dietzel broke the run by Robert Morris, scoring her 14th goal of the season to get the Dragons back on the board, but another goal from Kerr made it 5-2 for the Colonials. Drexel rallied to close out the half strong. Senior Grace Osterdale’s first goal of the season kicked off the run. Harris then drilled a free position shot, and Grady scored her second goal of the day to knot things up at five going into the break. In the second half, Robert Morris would go on another run to take a commanding lead. This time, the Colonials rattled off five unanswered goals. Goals from seniors Kerri Sayrafe, Sophia Eureka and Shannon Lynch put Robert Morris ahead. Crouse also had another goal, this time on a man disadvantage assisted by junior Melanie Gandy. The Dragons responded to this run with three goals in under two minutes to get back within striking distance. Grady scored another, followed by senior Marah Hayes’ fourth goal of the season and Dietzel’s second goal of the game. However, a Robert Morris goal by Mackenzie Gandy, assisted by her sister Melanie Gandy, and a power-play goal from junior Thalia Zolis gave the Colonials a 12-8 advantage. For the Dragons, Harris would earn the hat trick on a free position shot, making it 12-9 with 3:58 to play. A Robert Morris goal by Lynch put the game out of reach, but Grady was still able to score another goal to complete the hat trick. Grady leads the Dragons in goals with 21. Shots were pretty even on the day, with Robert Morris leading in overall shots 34-26 and in shots on goal 27-21. Sophomore Zoe Bennett led the game with 13 saves for the Dragons, while junior Katelyn Miller had 11 saves for the Colonials. The Dragons will go back on the road this weekend to begin Colonial Athletic Association play. The team will travel to North Carolina to take on the Elon University Phoenix Apr. 5 at 6 p.m. Drexel will then head down to Virginia to face off against the College of William & Mary Tribe Apr. 7 at 1 p.m.
Elon has battled mightily thus far this season. After starting 2-1 to open the season, the Phoenix have dropped seven straight matches. Elon’s schedule has been brutal, however, facing six nationally ranked programs including powerhouses like the No. 15 Duke University Blue Devils and No. 3 North Carolina University Tar Heels. William & Mary is currently 5-4 on the season. The team was riding a three-game win streak, but dropped a 12-11 overtime heartbreaker to the Coastal Carolina University Chanticleers March 24. 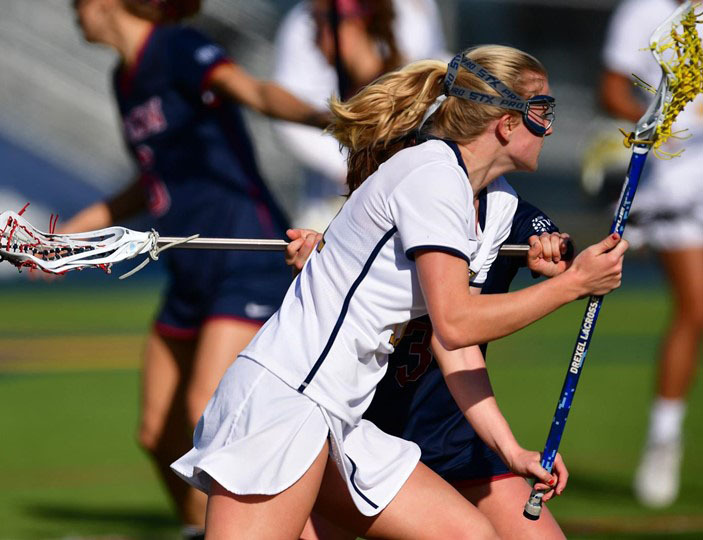 The team is led by freshman Belle Martire, who has netted 25 goals this season.